Hands-free foam soap dispenser powered by 4 AA-size batteries (not included) or optional AC adapter (72-ACA, not included). Body shall be type 304 stainless steel and all exposed stainless steel surfaces will have a Satin finish. An indicator LED shall provide status notification of battery condition, soap level and condition, and user sensor detection. Supply tank installed under vanity is clear with graduated markings to continuously provide soap level indication. Soap Requirements: Proper usage of this dispenser requires, that only soap within the following range for viscosity and pH may be used. 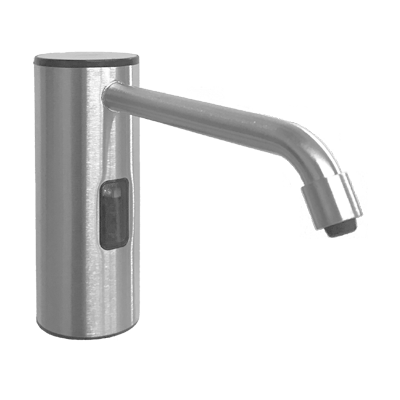 A complete Dispensing Chart and other relevant technical documents are available for all dispensers.